Mapping our wall and other features in Square 1, we christened the partly exposed major building at SAV1E “Building A”. Today, we discovered a new rectangular structure lined by mud bricks, just in the Northwest corner of Square 2 and thus still within “Building A”. The photo shows the first outline of feature 15 early this morning. In the geophysical survey of 2011, a sub rectangular anomaly was visible at exactly this location. Similar to the circular pits in Square 1, the new feature is filled with soft sandy material – maybe it is some kind of installation for storage. Associated ceramics are again mostly early-mid 18th Dynasty in date. 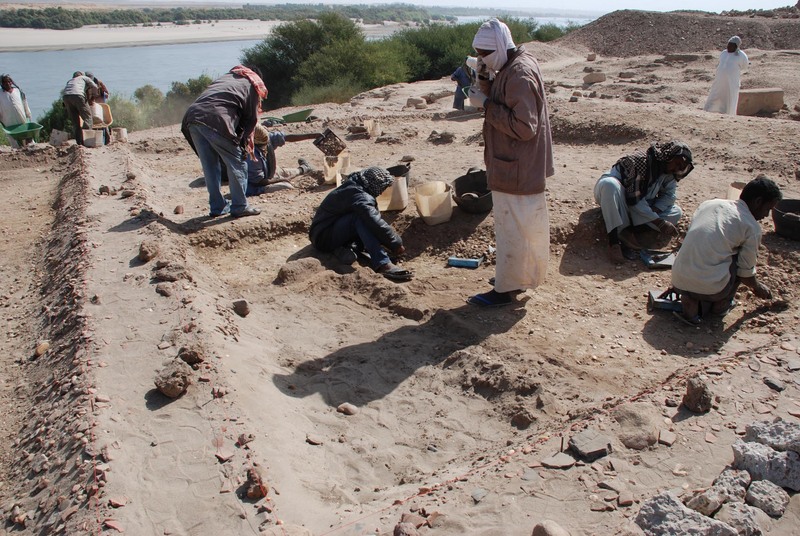 This entry was posted in 18th Dynasty, Archaeology, Settlement architecture, Upper Nubia and tagged Sai Island, Settlement archaeology by Julia Budka. Bookmark the permalink.